1. When Do the End Times Begin? 2. What Is the Fullness of Time? 3. What Are the Signs of the End (Matt. 24)? 4. When Will the Signs of the End Take Place? 5. What Are the Seal, Trumpet, and Bowl Judgments (Rev. 6-16)? 6. Should We Understand John’s Visions Literally or Symbolically? 7. When Will the Seal, Trumpet, and Bowl Judgments Take Place? 8. 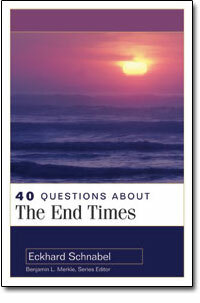 Will Christians Live during the Tribulation? 9. Who Are the 144,000 in Revelation 7? 10. Will the Church Disappear in a Rapture to Heaven? 11. Will the Work of the Church Bring about a Period of Faith, Righteousness, Peace, and Prosperity on Earth? 12. What Are Israel’s Old Testament Promises? 13. Does National Israel Have a Special Destiny? 14. Does the Modern State of Israel Represent Fulfillment of Prophecy? 15. What Is Christian Zionism? 16. Will a Third Temple Be Built in Jerusalem? 17. What Is the “Abomination of Desolation” in Jesus’ Prophecy? 18. Who Is the “Lawless One” in Paul’s Prophecy? 19. Who Is the Beast in John’s Prophecy? 20. Who Is the Antichrist? 21. What Is the Meaning of the Number 666? 22. Who Is the False Prophet? 23. What Is the Mark of the Beast? 24. Who Is the Great Harlot of Babylon? 25. Who Are the Two Witnesses of Revelation 11? 26. Who Are Gog and Magog in Ezekiel? 27. Who Are Gog and Magog in Revelation? 28. What Is the Battle of Armageddon? 29. What Is the Great Earthquake? 30. Why Will Jesus Return? 31. How and Where Will Jesus Return? 32. Will Jesus Return Soon? 33. What Is the Millennium? 34. When Will the Millennium Take Place? 35. What Is the New Jerusalem? 36. When Will the Day of Judgment Take Place? 37. What Will Happen to Believers on the Day of Judgment? 38. What Will Happen to Unbelievers on the Day of Judgment? 39. How Should We View the Prophecies of Prophecy Writers? 40. Why Should I Care about the End Times?